Is it Time to Change your Transmission Fluid? Checking this every so often is good practice. However, if you ever notice that the vehicle hesitates when your automatic transmission shifts gears or your check engine light has illuminated, be sure to give the transmission fluid level a check before you let any mechanic start talking about servicing your transmission. Simply adding transmission fluid is cheaper than having your transmission looked over. Therefore, it is always best to check your vehicle’s owners manual for which type of fluid your vehicle requires, and provide the proper car care. Learn More about our Included Intro Maintenance! 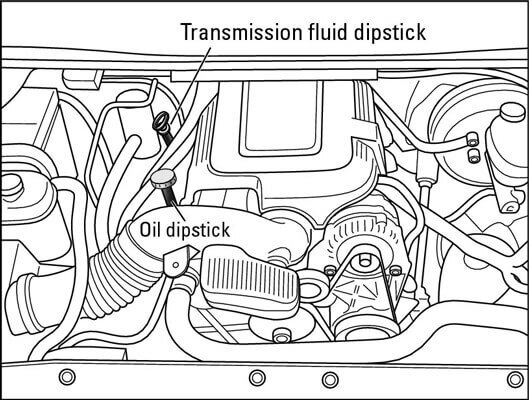 If your vehicle has front-wheel drive, the transmission fluid dipstick is will be located around the trans axle as shown on the right, else the transmission fluid dipstick location will default like the left picture. As discussed earlier, the owner’s manual knows best, by that we mean the vehicle may require extra steps like: does the the gearshift to be in neutral or park, does the parking brake need to be on, or do we have to have the engine running. Following these procedures, ensures that the levels are at their ideal location for making a manufacture’s recommended owners check that will give you a clean optimal read. 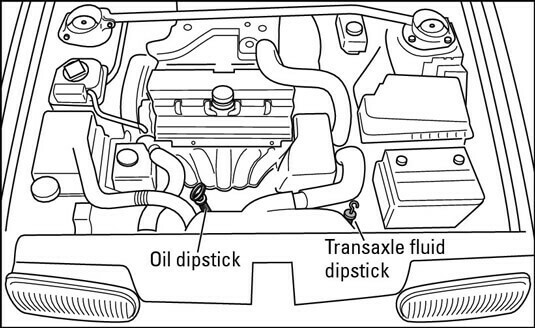 After locating your dipstick, have a lint free rag on hand then remove the dipstick. Clean off the dipstick with the rag and reinsert, just to remove one more time and observe the fluid marking line. Additionally, were going to do a consistency check, get a sample from the dipstick and apply some friction with the fluid between our fingers(if you don’t feel anything present like grit then all is well). Manual transmission fluid and Automatic transmission fluid should be an almost clear pink color; Be sure to notice any burnt smells, -the burning smell is caused by extra friction being created from the gears, which causes them to overheat and burn- chances are if you smell burnt fluid, you will see that there are particles in it. This means the fluid is losing its effectiveness and the fluid needs to be changed. Driving with bad transmission fluid will cause many harmful consequences for the future, and inevitably lead you to a breakdown topped with a repair bill. If a simple monthly check-list is what keeps a car healthy and in-line with it’s warranty, why not take the extra time. Furthermore, if you notice your transmission isn’t where or what it should be, go and have a mechanic drain and change the fluid to avoid any further exposure for the transmission. Not doing so would be completely void any warranty if failure were to occur. It is important to regularly check your vehicle to avoid any preventable problems. The purpose of these articles is to inspire drivers who may have skipped out on keeping an eye on their car’s condition. In the case you need to have your transmission repaired you should bring it to a repair shop immediately to avoid any long lasting damage to the rest of the vehicle.